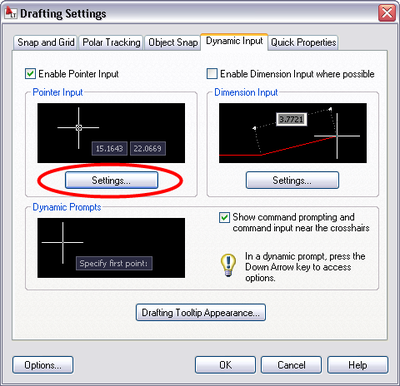 There are two ways to enter coordinates in AutoCAD LT. The first is absolute, when you know the actual coordinates of the point you want, like (5,3). The second is relative, when all you know is how far the point is away from another point. As in, "the end of this line should be 2 units up and 4 units over from the last point." For a long time, the only way to distinguish relative coordinates from absolute was to precede them with "@". Since the introduction of Dynamic Input, though, things have changed a little. It appeared that most people used relative coordinates much more frequently than absolute, and they were tired of typing "@" all the time. So the default settings were changed. Now, when Dynamic Input is on, relative coordinates can be entered directly, with no special symbols, but absolute coordinates must be prefixed with "#". So if you want to relocate something (an xref, maybe) to the origin (0,0), you'd have to type "#0,0". But maybe you like Dynamic Input, but you don't use relative coordinates very much, and now you don't like having to type # all the time. No worries -- there's a setting just for you. Right-click on the Dynamic Input icon (or DYN) on the status bar, and select settings. Under "Enable Pointer Input", click "Settings". 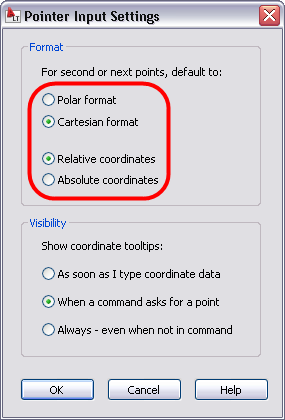 From there, you can choose whether the default format for "second or next points" is Polar or Cartesian, and Relative or Absolute. Personally, I use Cartesian coordinates more than Polar, and Relative more than Absolute, so that's how I have mine set up.